We discussed the idea of switching to the RoboCup Rescue competition, participating with a Emu Mini 2, part of the Open Academic Robot Kit. 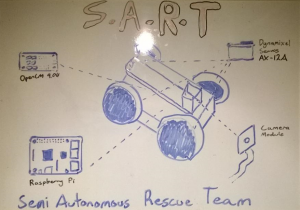 We’ve also expanded our team to include Aaron Maggs, as we are now working on the robot in both our Computer Studies class and our Digital Technology class. This lesson, Ryan and I have started learning Python on Codecademy. Fortunately, Python is a very simple language compared to others such as Java, which we have both used frequently in the past.